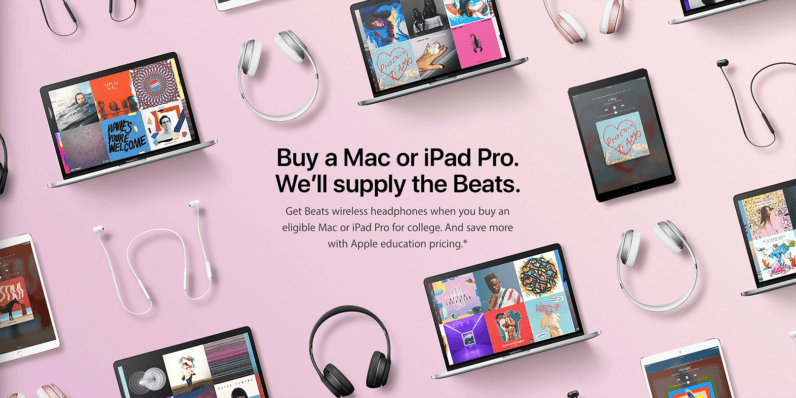 Apple today announced a deal offering free Beats headphones (up to $300) for any student purchasing a qualifying Mac or iPad. The deal, which is said to be for college students only, never actually asks for an ID or even if you’re a student — at least during my iPad purchase at Apple’s website today. MacBooks — including the Pro and Air — as well as iMacs, Mac Pro, and Mac mini are included in the deal. The cheapest of the bunch, the MacBook Air retails at $849, and includes Beats Solo3 Wireless, BeatsX, or Powerbeats 3 headphones ($299, $149, and $199, respectively). Or, you could go the tablet route with the iPad Pro, starting at $629. And again, Apple says the deal is for “college students only,” but never actually asked if I was a student, or if I could show a student ID. So, for now at least, it appears the deal is open to anyone.